I know everyone has a story from September 11, 2001. Today I shared that day with my ten year old daughter... it was hard for me to do, but she has been asking me a lot of questions about that horrible day. I think she's old enough to know and begin to understand how her dad and I were feeling that day. We read two lovely books that I highly recommend for families to share with their children: The Little Chapel that Stood and 14 Cows for America. As I read these books to my children, I cried. I didn't want to upset them, but I wanted them to understand that day and also understand the hope we have for the future. Our precious daughter had just been born 2 months before... the night before September 11 my husband had just finished putting together this wonderful swing for her. It played music and she loved it. It always seemed to put her to sleep. 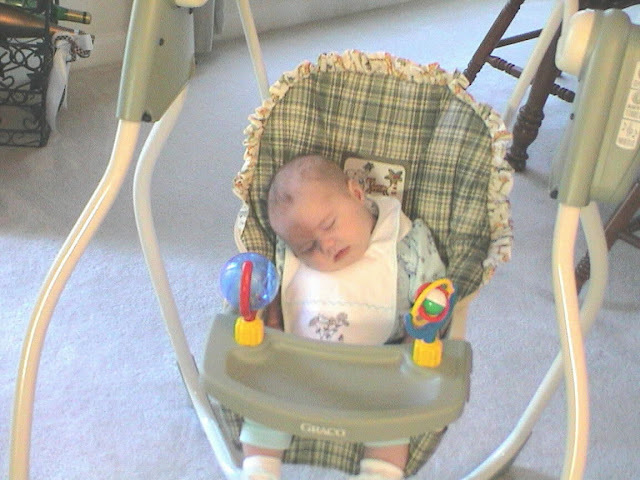 The morning of September 11 I was cleaning the house and Miss B was swinging happily, with the music playing. Life had been blissfully happy for me since her birth. She was the baby we always wanted and I loved being a mother. After the first plane hit the tower my father-in-law called me to see if I was watching the news. I quickly turned on the television and began to watch. Some instinct in me picked Miss B up and held her as I watched the rest of the day unfold. I never put her down that day. I was talking on the phone with my own father when the plane hit the second tower. It was then that my dad said we'd better get off the phone so I could free up the line if my husband (who was at work in downtown Atlanta) was trying to call. I also remember us talking about my brother, a naval chaplain, who was the chaplain at Camp David at the time. My dad was worried about him. I also worried about him and wondered how on earth he would minister to the president during this time. I also worried about his safety and possible deployment to a very dangerous part of the world. Watching the news the rest of the day was very scary, especially when I heard the financial center in Atlanta was also a possible target. People were leaving Atlanta in droves, and my husband's building was told to go home... he arrived home early that afternoon. Did I mention that September 11th is also my husband's birthday? He came home, and instead of going out we had a nice dinner at home in our dining room. We watched television while we ate, and our daughter slept peacefully in my arms. I still hadn't put her down. The days following September 11th were very unsettling for me. I was supposed to return to work in early November, but just couldn't bring myself to leave my precious baby in a day care setting while I was nearly 30 minutes away from her. What if something happened and I couldn't get to her? We really couldn't afford for me to stay at home. I quit my job first and told my husband second. Thankfully, he agreed to support me 100% and God provided for us. For me, the one good thing that came out of that day was a shifting of my priorities from a more ME-CENTERED mentality, to a family centered mentality. Thank God for that. Oh how I wish I had a better picture of my mom and dad with Miss B the day before her baptism, but the above will have to suffice. 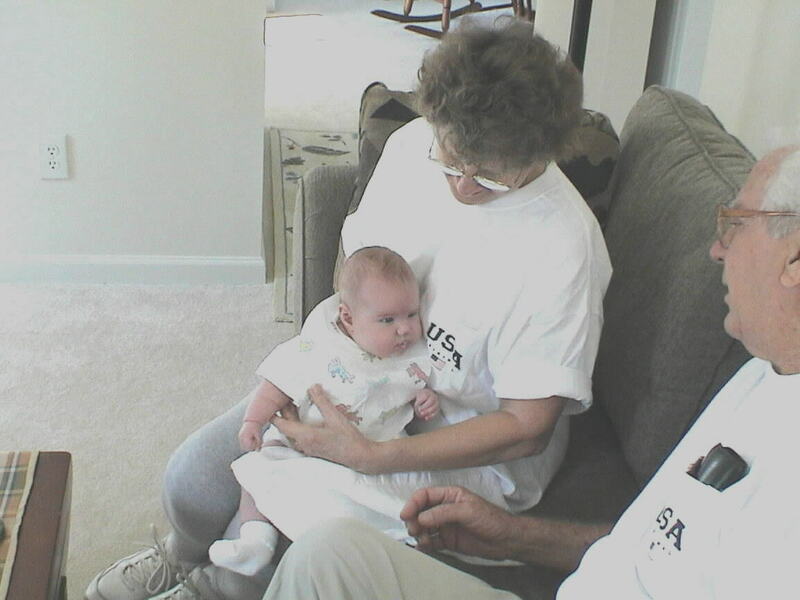 My mom and dad are both wearing shirts that say "USA" and Miss B had a onesie to match. My father served during the Korean War and my brother was (and still is ) in the Navy. He has since served two tours in Iraq, and I can tell you that the terrorist attacks continue to take their toll on the people of our country in untold ways. I remember my dad telling me that this would change our lives forever. I know it changed ours forever, and we didn't even lose a relative or friend in the attacks. I cannot begin to fathom what those thousands of families went through who lost someone. 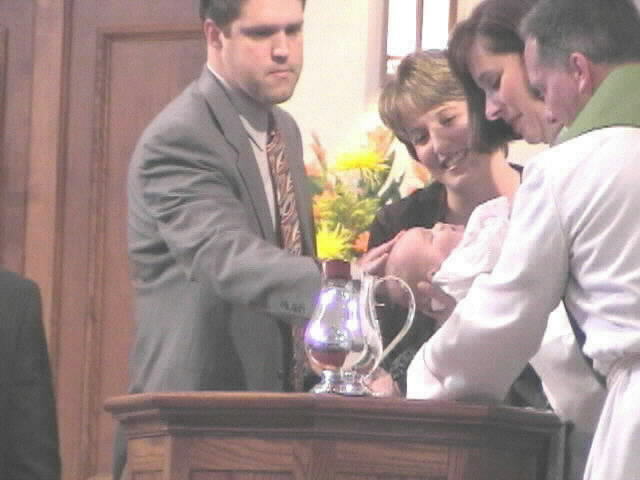 My darling daughter was baptized on Sept. 30, 2001... some of our out of town guests did not attend because of the uncertainty of air travel. I remember truly wondering what kind of a world we had brought this baby into, and I remember our pastor telling me we were equipping her with the very best shield possible - God's love. After my daughter's baptism we sold that wonderful swing that was only a month old... I couldn't stand to listen to the music anymore. It just made me think of that terrible morning. Since that day I know our country has never been the same. Yes, we had a patriotic fervor, but that died after about a year, don't you agree? Our economy has been on a down turn and it seems that the hope and optimism that existed in the 1990's has completely disappeared. No matter how hard most Americans work, it's difficult to get ahead. We know of at least three homes on our street that have been in foreclosure. At one point in time we had neighbors on all sides of us unemployed. We look to our government for leadership and find none. Perhaps we're looking in the wrong place. I pray for all of the families who lost loved ones on September 11, 2001. I pray for all of the service members who bravely serve and protect our nation on a daily basis. It all seems like too much to bear, and I hope those in pain feel God's arms wrapped around them.